IoT, with its ability to capture and analyse data to generate insights, is emerging as an enabling technology for defence in Australia, which is currently undergoing the most significant re-equipment since World War II. While defence was a driver of technological developments such as GPS up until the 1960s and 1970s, private commerce is driving the development of technologies such as IoT, and defence is positioning itself to leverage these technologies for its operations. This raises concerns about reliability and security of commercially sourced devices and communications networks. A major application is in national security, where defence will increasingly rely on IoT, and advanced and autonomous systems to protect society from threats such as terrorism. Data and digital warfare, intelligent bases, and maintaining the health and wellbeing of personnel are also areas where IoT solutions could be beneficial. Defence is taking an integrated approach to developing new technologies in collaboration with universities and industry, supported by the Next Generation Technologies Fund. As well as custom solutions, defence makes use of solutions and equipment developed for other industries, including satellites and nanosatellites, drones, warehousing, autonomous robots, smart energy, microgrids, and machine vision. In order for defence to take full advantage of IoT, it will need to update approaches to management and acquisition frameworks as well as considering the technical aspects of solutions. The architectural complexity of defence solutions is dependent on the usage requirements, and whether users are self-contained (as for a single mission) or distributed over a geographical area (for multiple missions or network capability). IoT solutions for defence typically fall into the ‘systems of systems’ area, including communities of interest and collaboration nets, as illustrated in the diagram below. For commercial off the shelf (COTS) solutions, a principle that applies is intentional obsolescence. This is the idea that the solution is not designed to last forever, but with the assumption that it will be replaced after a certain number of years. IoT applications within defence can also be divided into the categories of logistics and supply chain, digital/data warfare, health and wellbeing and intelligent bases. Health and wellbeing of military personnel can be related to those who have been injured in conflict or monitoring how people are dealing with the stress and pressure of operations. Intelligent bases encompass remote deployed bases rather than mainland bases. These remote bases are more intelligent, and interconnected with wifi, bluetooth, and other communication protocols, but can have additional security concerns. The major benefits provided by IoT solutions within the second set of categories are summarised in the diagram below. The Fight Recorder is based on the concept of a ‘black box’ recorder for soldiers, this device uses sensors to capture information about soldiers, their actions and motions, the operating environment, and can also be used as an emergency distress beacon. Data is transmitted via micro-satellite communications, and there is also an independently powered recording device on board. Once integrated, the onboard global navigation satellite system (GNSS) chip is expected to operate once every few seconds or event and intervals of a minute unless it is actively transmitting as a beacon. One of the challenges of integrating the inertial measurement unit (IMU) and the GNSS chip is that the chip is power hungry and will drain batteries quickly. A potential problem with using microsatellite connected IoT devices as emergency beacons for soldiers is that the latency of low earth orbit satellites might cause a delay in response. The data captured by the fight recorder can be used to inform, design and performance soldier equipment and protective wear. 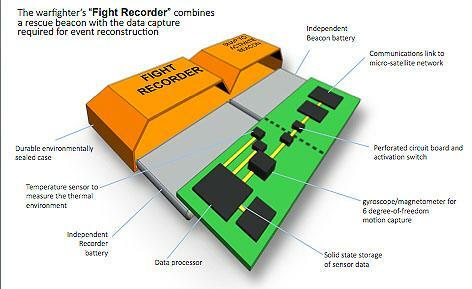 A diagram of the Fight Recorder’s components is below. This device also has the potential to be used to collect, log and transmit life signs such as heart rate and respiration. An operational concept diagram is shown below. Recent developments in IoT low power electronic components, as well as long life battery technology, has made the deployment of these devices in real life defence environments more practical, as the battery could last for years without needing to be changed. Motion data can be downloaded at the end of the mission, but also progressively uploaded through micro-satellites currently in development. The analysis of motion data will be used in conjunction with computer models to develop accurate models of soldiers’ body movement. In turn, this will be used to develop event reconstruction algorithms for the Fight Recorder. 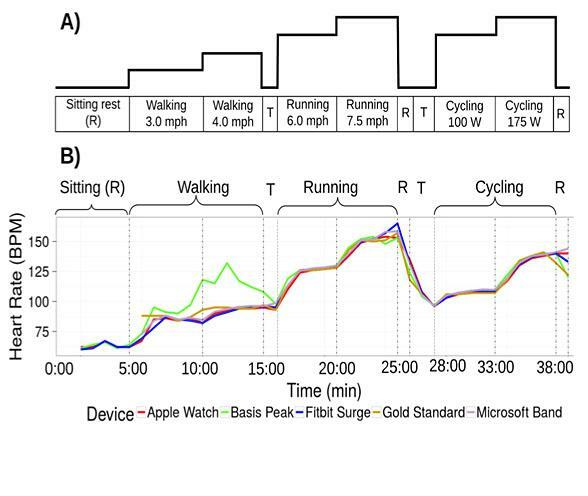 An example of data analysis using other motion-detection devices is shown below. Defence has used sonar array networks (using sonar buoys) for underwater IoT applications. They also make use of seabed sensor arrays deployed by organisations including the Australian Institute of Maritime Science and <spell out> NOAA in the US. In Australia, which has limited seabed arrays, there is also potential to use networked sensors mounted on unmanned underwater vehicles or vehicles on the surface of the water (unmanned boats) which could communicate among themselves or via microsatellite networks. The Internet of Military Things concept uses sensors in remote, austere or degraded environments, internetworked through Low Earth Orbit (LEO) micro or nanosatellites. The aim is to provide persistent situational awareness of operational environments, for example, chemical threats; as well as the awareness of forces, for example, monitoring the health status of soldiers through Fight Recorders. This is illustrated in the diagram below. The idea is to enable defence personnel to be able to rapidly deploy a network of sensors, including mobile sensors such as UAVs, which is uploaded to a cloud and shared with operators. A multinational defence trial was recently held in Adelaide to investigate the benefits of integrating wide-area aerial intelligence, surveillance and reconnaissance (ISR), ground sensors and target data to tactical operations in urban environments. Using an open systems architecture <link to open systems> for unattended sensors designed by the US military, the five nations participating in the trial (US, UK, Canada, NZ and Australia) were able to integrate technologies developed in each of their nations within a week for field testing. 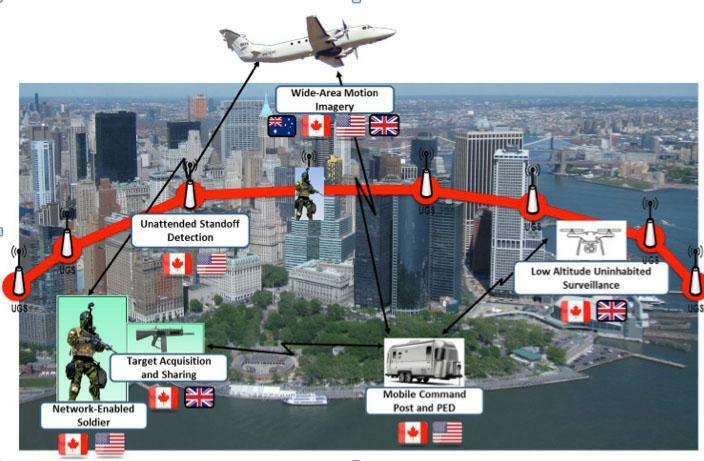 A second trial is planned in Canada and will integrate additional technologies including GPS-denied 3D mapping and an Internet of Military Things concept demonstrator. Australian Defence is funding partnerships with IoT small to medium enterprises and universities through the Small Business Innovation Research for Defence (SBIRD) program which offers grants and collaborative research opportunities. This approach has been successful in stimulating innovation in Defence IoT and other technologies in the US. The diagram below highlights some of the potential challenges for IoT in defence. The left column highlights the main area of interest in using IoT solutions for systems of systems, the middle column the challenges, and the right-hand column the characteristics, capabilities, and features that defence needs to control. For example, IoT can introduce additional vulnerability through factors including cybersecurity, security, resilience, privacy, and control. Defence employs solutions outside of the IoT sphere, and shares solutions with allies, so commonality and integration are important, as is data ownership. Environmental conditions can be harsh, including heat, dust, and water. Another challenge is adjusting to an expendable mentality with intentional obsolescence. Things move fast in IoT and defence is not used to continuous change. Solutions to these problems will require not only technical input but changes in non-technical areas such as strategic, contract and project management; standards; supply chain and acquisition; risk management and collaboration boundaries. Communications present specific challenges for IoT in defence. Military operations in remote areas or at sea may not have access to terrestrial communications networks. They are addressing this problem by tapping into low power, low-cost microsatellite communications. Other concerns are that in a conflict, satellite communications might not be available and that communication can reveal the location of the defence operator, which could put them in danger. 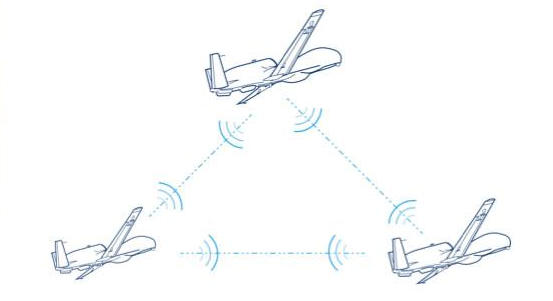 One solution to these challenges which has been deployed in Defence is using UAVs as ‘data mules’ that move between various locations to collect and deliver data as illustrated below. A fleet of UAVs intelligently can arbitrate among themselves to determine which vehicle goes to each particular location to collect or deliver data. This approach has challenges, including controlling multiple UAVs from the ground, the limited time of UAV continuous operation (typically three to six hours). Another challenge is keeping fixed sensors in the air at around 20,000 km above the Earth’s surface. Balloons have been trialled but were blown out of position by the wind. Heavy sensors and equipment can also be a challenge in the air. To decrease their reliance on satellite communications, Defence is also looking, in the long term, at directed point-to-point communication systems which combine electronic warfare radar and communications through a single device. Another challenge is ensuring that defence IoT devices and communications networks are not accessed by hostile parties. IoT technologies in Defence are currently in the experimental phase. When operational, significant investment will be made in anti-tamper devices such as auto-erase when a device is attacked. Satellites, particularly large, expensive satellites, are also vulnerable to attack. To address this issue, the US military is considering a private Defence Low Earth Orbit (LEO) satellite constellation with persistent global coverage. Equivalency could involve considering adoption solutions which have been built in accordance with international rather than Australian or military standards, as well as planning for short product life. If an IoT solution is trusted and proven in other settings, validation in a defence setting using a pilot program might be a better use of resources than revalidating the solution completely. Operational libraries can be built using a digital twin or ‘sister’ (similar but not quite identical system). Digital twins are worthwhile in the defence environment for setting up bases, logistics, and training. They can also replace the need for maintaining excessive system documentation. Importantly, changing a system to comply with military or Australian standards, or adding capability, means that it is no longer an off-the-shelf IoT solution. An alternative flexible solution is designing an additional transforming application that enhances the functionality of the existing solution. Recommendations for acquisition and development lifecycle considerations include looking into incremental, agile, lean and evolutionary lifecycles, as well as further use of digital twins. Virtual engineering approaches – which use virtual or augmented reality could also be an option; as could model-based engineering and a minimum viable product approach. It is a good idea to avoid defining contract milestones prior to agreeing on the lifecycle to be followed, and excessive documentation. Because risk profile will vary over time with a commercial IoT solution, it should be made adjustable and shared between stakeholders as much as possible. When defining the problem to be solved some of the approaches above could also be used in design as well as designing to specification, and designing to market. Designing to flexible capability or dedicated capability could also be used. The best approach is to take advantage of the best engineering approach to address challenges and avoid over-specifying, as especially with AI, robotics and autonomous systems they will not be deterministic, and predictions and set test programs will be difficult at the start of a project. There is also potential for automating some decision making in environments which it is difficult for humans to access or control, and evolving technologies such as blockchain can assist in addressing vulnerabilities in cybersecurity. Big data analytics can help users gain insights from the large amount of data available in defence applications. Because environments are becoming more unpredictable, a shift to less rigid technical governance, which avoids defining details for the unknown is a good approach. Instead, project managers and engineers should plan to contain disruptions if they occur, and implement learnings in the future. Similarly, risk profiles need to shift from assigning responsibilities at the start of programs and taking a penalty-based approach to becoming more flexible with shared responsibility in increasingly uncertain conditions. Webinar titled ‘Defence Next Generation Technologies: Driving Innovation in Defence’ by Dr Alex Zelinsky AO, Chief Defence Scientist, Department of Defence.